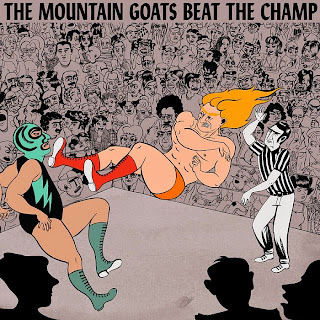 The music world has been abuzz since The Mountain Goats released their latest album, Beat the Champ (last week on streaming platforms, this week for vinyl and compact disc geeks). 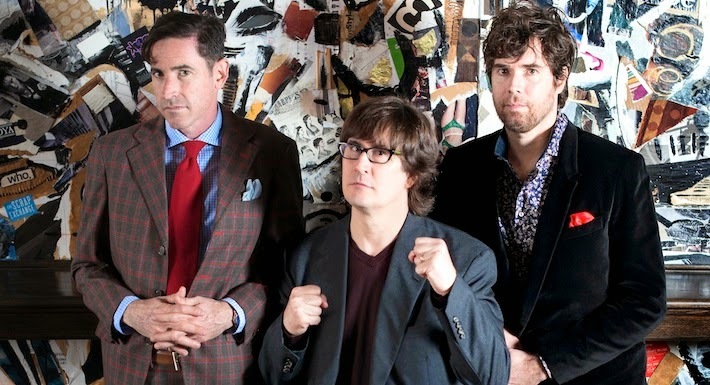 Though nearly every review has been positive, they all seem to run on a spectrum of either calling lead singer John Darnielle's fandom cute to harmlessly labeling the album as kitsch. No, not even decades of writing well-regarded music or even being an award-winning novelist can shake the stink pro wrestling gives off to the uninitiated. Now by no means am I a seasoned music reviewer (I believe I wrote one review, that on a Weird Al CD I bought in 6th grade), but I feel this album at least deserves a once-over by someone who respects pro wrestling in the same ways Darnielle supposes to: as a nuanced, populist chameleon of an art form with characters that screenwriters and TV producers alike would sacrifice their children for. Having listened to the album numerous times now, it's clear that Darnielle is going for a concept album—but about what? The fantasy? The folklore? His own childhood fandom and how it's morphed with his life experiences? To be honest, it's kind of a melting pot of all this, and then some. The album begins with the oddly-timed piano notes of the retrospective Southwestern Territory. When Darnielle's high, vulnerable tenor comes in and he starts rattling on about the story of a haggard wrestler finally discovering his loneliness, we understand that this is an old hero's goodbye—a movie beginning at the end. 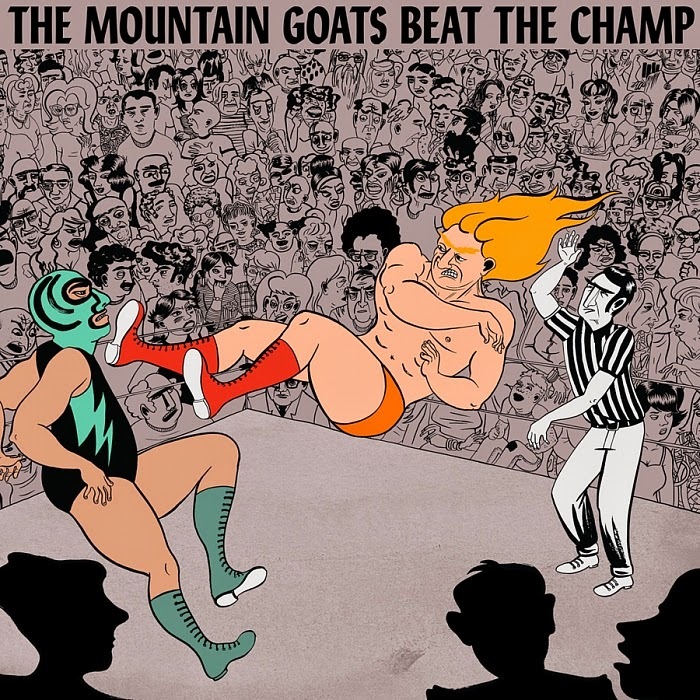 After this quasi-prologue, Darnielle and his bandmates begin our journey proper with The Legend of Chavo Guerrero. It's told from a fan's perspective, allowing us to associate our own personal heroes with the legendary Chavo and what they meant to us as children. Sometimes they'd even take the place of our own father figures, as Darnielle has alluded to in past songs. "You call him names to try and get beneath my skin/Now your ashes are scattered on the wind", he sings almost nonchalantly, before continuing on about how, unlike his abusive father, the Legend of Chavo lives on. Foreign Object is an uplifting, brassy affair of an old-fashioned promo come to life. As fans of wrestling, the only thing we love more than the drama and the stories is the spectacle of the show itself, up to and including one man stabbing the other with something sharp. Only real wrestling fans will understand when Darnielle sings "March through the red mist, never get my vision clear/Learn to love this kind of atmosphere". When we get to Animal Mask, we start to see a method developing where the band alternates between the frantic and the finessed. This particular track takes us on a more sentimental journey of a wrestler reminiscing on starting out and perhaps seeing himself, or maybe even his former teammate he came up with, getting passed by. It's the nature of the business for partners and friends to split, though you have to wonder if Shawn ever called Marty on the phone and sang "Some things stay sweet forever" in the folk-ish, sing-song way Darnielle goes about it. Shortly after this one ends, Choked Out comes in, and in just 1 minute and 43 seconds the song paints a beautiful pastiche of those old, toothless juggernauts of our parents' & grandparents' generations. "If they all wanna die dead broke that's fine, that's fine/Everybody's got their limits, nobody's found mine!" Darnielle shouts, channeling these behemoths and their cheerful stubbornness regarding pain. At about the halfway point, Heel Turn 2 comes in and is the true highlight of this entire presentation. Perhaps the most emotional aspect in wrestling, the 'Heel Turn' can be linked to the more emotional parts of true life. Maybe you find that someone close to you isn't all they appear to be. Maybe you even trick yourself into thinking you're someone else until your "breaking point" is uncovered. "Let all the trash rain down from way up in the rafters/I'm walking out of here in one piece, don't care what comes after" is Darnielle's grand proclamation towards the end of the song, defiantly stating that you've only got yourself to take care of and look after in the end. The second half of the album begins with a bit of a soft jazz, lounge music affair in Fire Editorial. It's got all the soft cymbal hits and playful piano one might hear upon returning from the lobby at intermission. However, the lyrics play out as anything but light-hearted, digging into some of the darker aspects of the sport like deaths in the ring and the fatal rioting of fans. It's almost fitting that it leads into our first wrestler retrospective since Chavo with Stabbed to Death Outside San Juan, an obvious portrayal of the murder conspiracy surrounding Bruiser Brody. As fans, it's these kinds of stories that make wrestling the unique and tragic experience it is to follow, but the band does a great job tackling the story with class. With Darnielle's forceful spoken word and a foreboding, underlying bass playing beneath lines like "Sometimes you get some heat/Sometimes it follows you around", it almost sounds like a radio play. If you thought the Brody story shook you before, allow this one to accompany the images you've already built in your mind for a true trip. I'm going to allow my own subjectivity come into play with the next track, Werewolf Gimmick. Not only do I love werewolves, but the idea of a man truly believing he's a wolf when he dons the gimmick just strikes such a cord with me in all the right places, especially with goosebump-inducing lines like "Nameless bodies in unremembered rooms/Know how a man becomes a beast when the wolfbane blooms". Luna is the next track, another soft ballad to follow the hugeness of the previous song, and it has some haunting, soft chorals that ebb and wane throughout. Unmasked! could have been performed by Elliott Smith, and no one would have been the wiser. It's a gorgeously written ode to the importance and respect between the masked fray of wrestlers, and hides a little double-meaning when one wrestler says to the other, "And by way of honoring the things we once both held dear, I will reveal you", leading one to wonder if, by the end, our masked wonder is singing this to himself in a mirror. The final two songs of the album appear to bring us full circle. With The Ballad of Bull Ramos, we have the yarn of a washed-up wrestler still clinging to his glory days. Even as his body gives out on him and he has to make more and more frequent doctor's visits, he's not afraid to answer the question "Aren't you that old wrestler with the bull whip?" with a bold "Yes sir, that's me. I'm him." And then we have the closer, Hair Match, which, just like the previous Unmasked! allows us to see how more than just some shocks of hair are stripped away when a competitor loses this particular match. There's a loss of dignity too, especially when the competitor is told "nobody will ever see this". By the end, Darnielle, now a bit aged and a little wiser, sings to that old wrestler he watched in his childhood: "I loved you before I even ever knew what love was like". Now what, for a wrestling fan, hits closer to home than that?